Home > Articles > A sad Leopard in Saudi Arabia! A sad Leopard in Saudi Arabia! I do have a small and quick rant about Leopard, a source told me that Apple’s Saudi Arabia distributor, Arab Computers (you can check their official, blank site here) have brought only 25 copies of Leopard to the Market. One of the Apple resellers asked for 250 licenses and they are only getting a literal handful of copies. Apparently the resellers were expected to make illegal copies of Leopard! And I know of at least 1 store that offers illegal install of Apple software. While our friends in UAE are enjoying an actual launch event only 2 days after the official release of Leopard while we wait for the humble distributor here to actually provide enough licenses to cover to Saudi market (which is way bigger than 25). I did not install a “downloaded image” of Leopard but I ordered one from Amazon and had it shipped to me. In case you did not get your copy of Leopard yet and you want to support our site, please consider buying it from Amazon through us (as we get a small percentage of the sale). 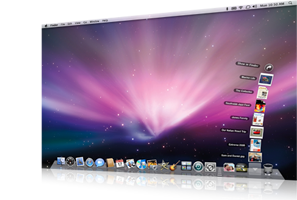 You can buy it from this link: Apple Mac OS X Version 10.5 Leopard .